Allergy symptoms can have a dramatic impact on our quality of life. Unfortunately, our homes are not a safe retreat from allergen exposure, as indoor allergies are also a cause of snoring and other sleep problems. Indoor allergens can reduce the quality of your sleep, which in turn can increase daytime sleepiness, fatigue, and depression. Failure to eliminate indoor allergens can reduce the effectiveness of other efforts to improve your sleep, including snoring aids. Your ability to sleep hinges on your body’s capacity to relax. 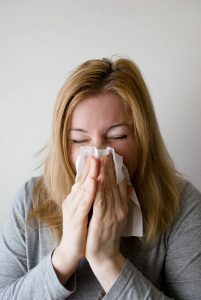 When your body is exposed to allergens, the immune response can cause symptoms including throat irritation, sneezing, and nasal congestion and inflammation. If you’re experiencing these symptoms, the discomfort can keep you awake for a long time. Allergens can also cause snoring. Irritation and swelling in your throat and nose can cause vibrations that make noise as you breathe. The resulting sleep disruption doesn’t just affect you – it can keep your family awake, as well. If your family is complaining about your snoring, or if you experience unexplained fatigue and sleepiness, it’s possible your body isn’t getting the kind of deep sleep it truly needs. Quick fixes like melatonin pills ignore the underlying allergy issues that could be keeping you awake. All homes will contain some amount of dust, and people sensitive to dust will find themselves constantly fighting allergy symptoms as that dust gets airborne. Every surface, from your blankets to your kitchen counters, can collect some amount of dust. The more surfaces you have in your home, the more dust can accumulate. While it’s gross to think about tiny bugs that feed off of dust, the sad reality is that dust mites are another common allergy trigger. Mites survive most cold-water washing, so bedding can quickly accumulate mites if homeowners neglect to use hot water. Investigate the possibility of a dust mite allergy if your sneezing and other allergy symptoms intensify in areas of your home with a lot of upholstery. Even if you try to stay indoors during allergy season, pollen can make its way inside through open doors, air conditioning systems, and even window screens. If your allergies only flare up for a few months out of the year despite being inside most of the time, it’s possible that pollen is getting into your home. Like dust, pollen can accumulate easily without constant cleaning, and it can even linger on clothing after you’ve come inside. Different breeds of cats and dogs can create slightly different types of dander, so just because you had a cat as a child doesn’t mean you’re immune to cat allergies. Like other indoor allergens, pet dander can cause varying degrees of allergic reactions, so you may not even realize your pet is impacting your sleep. If one member of your family has worse allergy symptoms than everyone else, it’s entirely possible that member has an undiagnosed pet allergy. Most people assume their house is free of sources of mold if cleaned on a regular basis. However, sometimes mold can grow in unexpected places, especially in regions with humid climates. Even floorboard cracks can allow mold to grow in the right circumstances, so common locations like bathrooms and basements aren’t the only possible culprits. Even if you don’t experience allergies from other sources, mold could be affecting your ability to breathe and sleep properly. Washing your sheets, dusting, and vacuuming regularly can help reduce the amount of allergens in your home. Investing in a hypoallergenic mattress or mattress cover can also help protect you from dust mites. Consider making your bedroom a pet-free zone if you suspect pet allergies may be causing sleep issues. If you suffer from seasonal outdoor allergies, make sure to replace your air conditioner filters on a regular basis to keep pollen out of your home. Deep-cleaning your house, especially in areas close to bedrooms, can reduce dust and mold dramatically. It may be worth it to periodically hire a professional cleaning company to clean hard-to-reach places. Replacing your shower curtain is also critical to keeping indoor allergy symptoms at bay since the bottom of plastic curtains can accumulate hard-to-see spots of mold quickly. If a wall or other soft surface begins to grow mold, getting a professional construction contractor to replace it may be your best course of action. Tile surfaces in bathrooms can be a worthwhile investment for bathrooms that don’t ventilate well and remain humid for long periods of time. Ultimately, improving sleep quality may require an array of tactics. If snoring is affecting your sleep, allergy medication may be necessary to reduce throat inflammation and nasal congestion. Most traditional stop snoring mouthpieces aren’t an option if you experience nasal congestion due to allergies, so make sure to eliminate allergy symptoms before exploring other snoring reduction methods.